Can established software giants — Microsoft, Apple, even Google — get “the social web”? From Microsoft, we have the ignored “social” tab on the Zune; from Google, the death of Wave (less than a year) and lackluster response to Buzz. 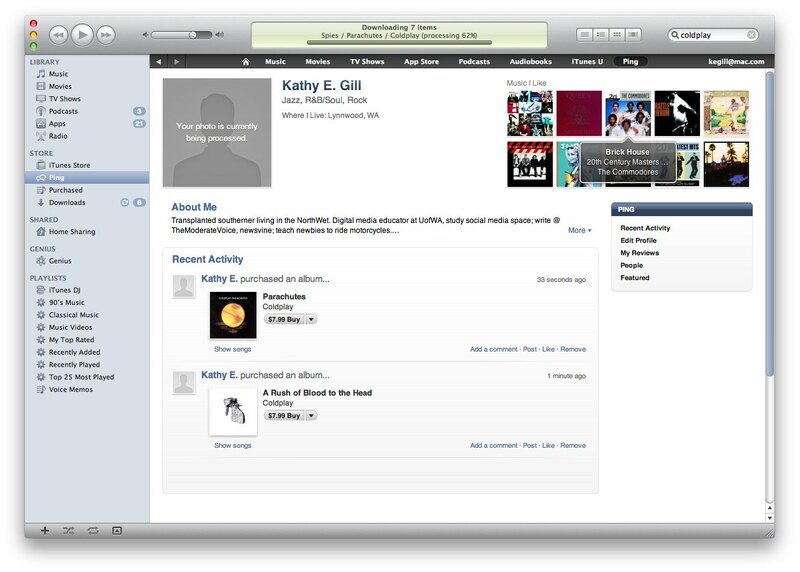 @kegill Yes, social music discover should be great, especially for the artists. These opposing views reflect my gut-feeling. Maybe — maybe — there is room for a niche social network for people who like to buy their music. If so, it seems to me that Ping’s primary competition is Amazon and maybe MySpace, not Facebook. I waited until today to try to download QT10 and activate Ping. 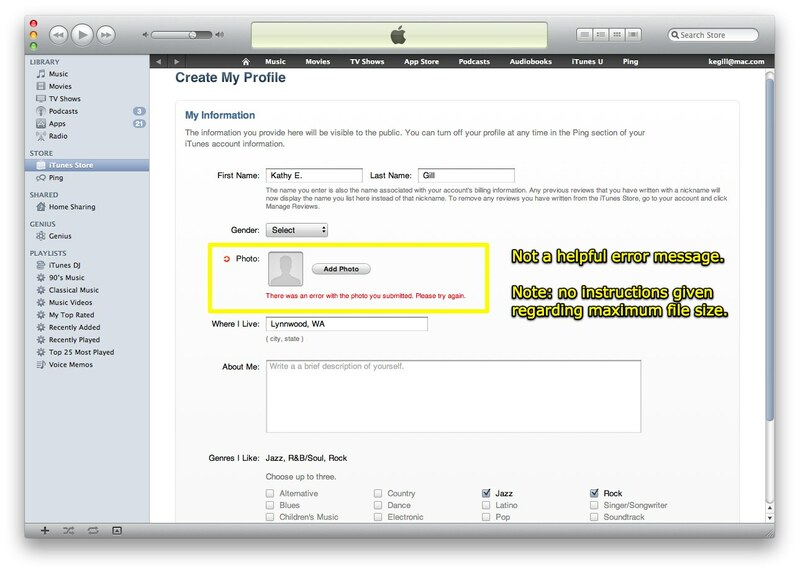 First, Apple tries to make it absolutely clear that there are privacy implications to activating Ping. For this, Apple gets an A+. However, on profile customization, the grade drops to a C.
Why? The error message I got when I tried to upload a 250MB photo was, to say the least, less than illuminating. What’s worse, even after I reduced the file size to 25MB, I got the exact error message! At that point, I made a deduction that the problem was on the server end. So I tried a third time to upload an image (the 25MB one) and number three was a charm. Or so it seemed. I checked 30 minutes later: my image on the profile itself was still being processed. Next, how to find “friends” on Ping? Here, the grade plummets to an F.
Despite the implied connection to Facebook, there is no discovery feature. This gaping hole punctures Steve Jobs’ emphasis on “discovery” as a foundation of the new iPod/iPhone/iPad/iTunes line-up. 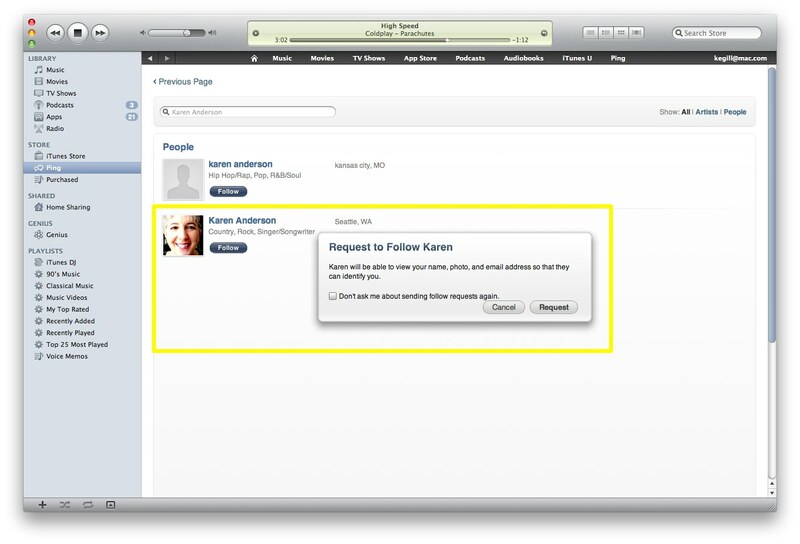 Instead, Apple wants us to use its search or send an email! The later makes my head explode, it is such an old-school method for connection. I agree that providing a way for someone to send a personal note is appropriate and necessary, but it should not the only way to connect in a digital social network. Fortunately for this review, one of my friends had posted on Facebook that she had activated her Ping account. I typed her name into the search box and, lo and behold – a miracle. It worked! 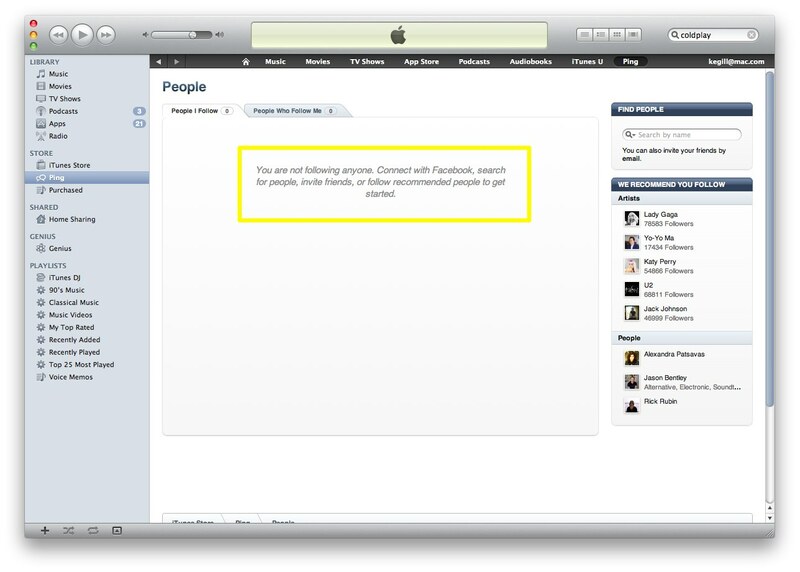 Moreover, Apple again makes it very clear that connecting on Ping is different from connecting on Facebook and Twitter. 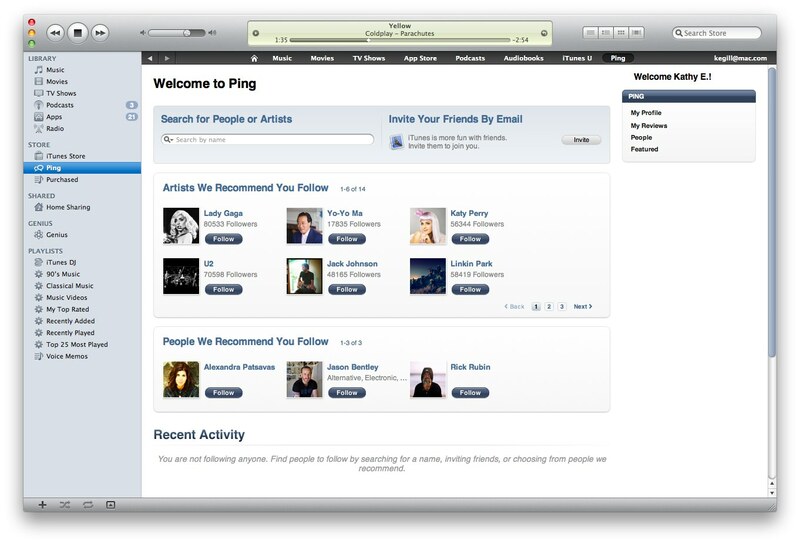 For this, old-fashioned as it may be, discovery option, I’ll give Apple an A.
Let’s look at the Ping home page. The fact that Lady Gaga is the number one suggested artist for me to follow … even though Apple has known my music purchase history for years … I have to downgrade this recommendation system to C-. No way in hades will I buying Lady Gaga unless I need to use something of hers in a class. Ugh. Apple took a soiled page from Twitter’s playbook with this one. 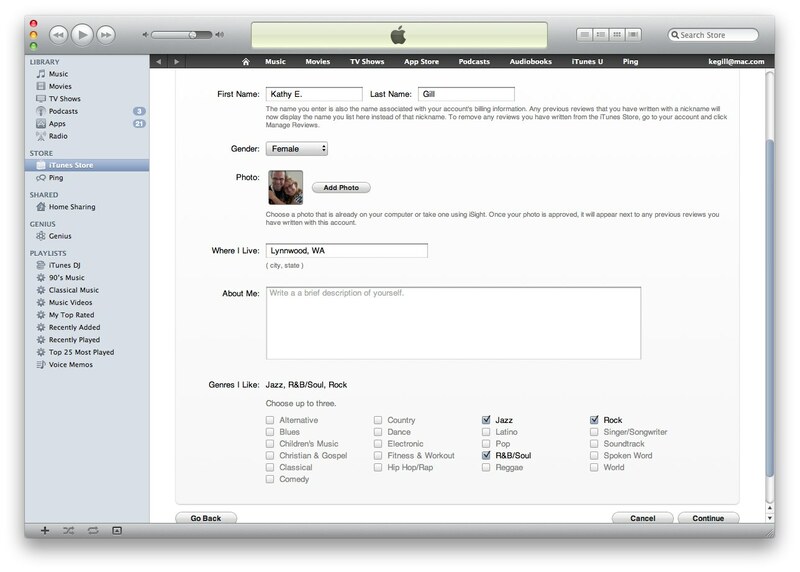 How quickly will Apple move to make it easy to integrate existing social circles into the circle of music that is Ping? How many people truly want to expand their musical repertoire? I’m going way out on a limb and will suggest that there is a demographic component here, with older folks generally being less experimental. However, older folks are, I believe, more likely to open their wallet or swipe their plastic to buy music. How often do people open iTunes? I know some people do this at least daily — at least their iPods or iPhones connect daily to download podcasts. It seems the larger the drive on the iPod/iPhone/iPad the less likely there is to be daily forays here. That means my next step will be to explore the integration on my iPhone4. As a stockholder (that’s a disclaimer), I certainly hope Apple has success with Ping. But as an observer and critic, I think there is an uphill battle ahead. :: WiredPen link : Follow Me on Twitter! What To Do When You Tweet A Lie?